This blog entry is part of a series of blogs from Marvin and Martie Wachs, long time friends and supporters of Amizade who have visited and served in Bolivia numerous times. Bolivia is celebrating the beginning of spring. In Cochabamba, the snow is melting from the peaks of the surrounding Andes mountains. The jacaranda trees in plazas, gardens and streets throughout the city are sprouting vivid purple blossoms that frame the sky. Later, the blossoms will drift lazily down to the ground to form carpets of rich purple. Bolivian children are tingling with the anticipation of freedom – schools will let out for summer vacation by late November or early December. So it is the perfect time to celebrate the Dia de Peatones. 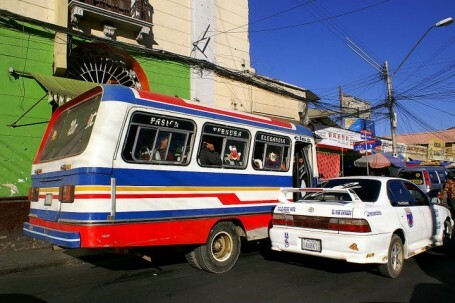 On a Sunday in September, the cities of Bolivia declare the “Dia de Peatones” (Day of Pedestrians) and ban motorized vehicles from their streets. Cars, buses, motorcycles, and taxis are all prohibited. Walkers, bicyclists, roller skaters, and baby carriages are encouraged to take over the streets. And people flock to the streets in huge numbers, whole families strolling together, young toddlers racing after their older brothers and sisters in the middle of the wide tarmac that only yesterday was filled with noisy, hurried vehicles. Refreshment and snack stands pop up everywhere. Arts and crafts are for sale in the main plazas. Impromptu games of soccer or volleyball pop up here and there. It is a day for strolling and visiting and being outside with no traffic noise, no fumes and exhaust, no worries about children running into the streets. “We enjoy this day in celebration of our environment, but also in celebration of pedestrians. Our city is not just for vehicles, but also for the people,” said one of the officials in a local newspaper. We were in Cochabamba a few years ago with the Amizade. Our service learning program was building a rural school, but we were spending the weekend in the big city, doing some sightseeing, practicing our Spanish, and trying to absorb some of the wonderful cochabambino ambiance. Luckily, the Dia de Peatones came on the Sunday of that weekend. It was an amazing feeling to have full run of the city without any worry about vehicles. To swarm the streets and wide avenues in a leisurely fashion, and not care when and where you crossed the street. It was more like a county fair and less like a cosmopolitan downtown. It was a time when life slowed down and people came together to enjoy fresh air activities. This year (2011) the Dia de Peatones was Sunday, September 4. Throughout Bolivia, the major cities of LaPaz, Santa Cruz, Cochabamba, Sucre, and many others joined in honoring the environment and celebrating the power of pedestrians. It might be a celebration well worth adopting in cities here in the United States. For more information on Amizade’s programs in Bolivia, and to apply for upcomming programs, click here.